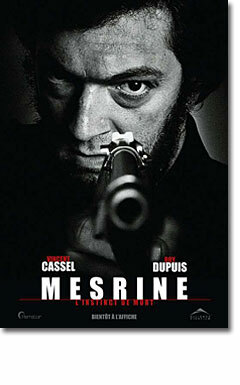 “Mesrine: L’instinct de mort,” the first part of a two-part movie on notorious French gangster Jacques Mesrine, which, in February 2009, garnered Vincent Cassell the Cesar for best actor and Jean-Francois Richet the Cesar for best director (but lost best picture to “Seraphine”), and which only now is being shown in U.S. theaters, is a zippy biopic about a brutal man who crammed a whole lot of activity into a short span of time. At one point, for example, we see him, after an attempted bank robbery, walking into prison. The graphics inform us: Evreux Prison, 1962. His wife and daughter visit him there; he’s overjoyed to see both. He serves his time. When he gets out he goes straight. He gets a job at an architectural design company, working for a man named Tabacoff, has another kid, then a third. But times are tough, Tabacoff has to lay him off, and when he does Mesrine returns to a life of crime. His wife objects. In one scene she threatens to call the cops and he smacks her, then forces a gun into her mouth and tells her, “Between you and my friends, I choose them. Every time.” His young son is watching on the landing above. “Mama?” he says. “Take care of your kid!” Mesrine sneers, and goes out into the world. But his boss, Guido (Gerard Depardieu), tells him times are changing, Pres. de Gaulle is cracking down on their syndicate, so Mesrine has to get inventive. In the next scene he walks into a bar, and the graphics inform us: Paris, 1966. You’re kidding. Four years for all that? How long does it take to serve time for armed robbery in France? How long does it take to have kids in France? Initially I feared the film would justify this man’s brutality, and initially it does. In the army in 1959 we see Mesrine shoot and kill a helpless Algerian rebel—but only because his commanding officer ordered him to shoot and kill the rebel’s helpless sister, and this seems the better option. Mesrine berates his henpecked father—who was also a collaborator with the Germans during World War II. Mesrine kills another Arab, a pimp named Ahmed (Abdelhafid Metalsi), but only after Ahmed brutalizes Mesrine’s favorite prostitute. Mesrine’s a defender of women! Until, of course, he goes off on his own wife. But, of course, she threatened to call the cops on him. At least the brutality throughout isn’t sugarcoated. When Guido and Mesrine take Ahmed for a ride, after promises of safety have been made, they slowly, sadistically, go from polite to insulting. “What do you say to an Arab in a suit?” Mesrine asks. “Defendant, please rise!” he answers, and Guido cracks up, then apologizes, then tells his own Arab joke. Ahmed’s eyes begin to falter as the ride continues. When it ends, in a desolate spot, they brutalize him. They beat him and strip him before an empty grave. Then Mesrine stabs him in his lower back and cuts up. We see the blade go into his skin, we hear Ahmed scream. It’s tough to watch. Finally, they roll him, still twitching, still alive, into the shallow grave and shovel dirt on top. These are not nice men. At the same time, neither was Ahmed. That’s why we need the kidnapping of millionaire Georges Deslauriers (Gilbert Sicotte). In ’68, Mesrine and his Bonnie-and-Clyde-esque girlfriend, Jeanne (Cecile De France), flee France for Montreal, and she finds them a gig as housekeeper and chauffer to Deslauriers. First we see the beautiful mansion. Then we see the kind, wheelchair-bound Deslauriers. I almost flinched the first time Mesrine pushed Deslauriers toward a pair of French windows, recalling Richard Widmark and a flight of stairs, but for months he simply does his job. Then Jeanne gets into a fight with the gardener, and Deslauriers, taking the side of someone he’s known for 20 years over someone he’s known for three months, dismisses the two. That’s when Mesrine gets angry. In the next scene, he and Jeanne are watching television in a non-descript, high-rise apartment, and slowly we become aware of noises from another room. So does Mesrine. He stands up, pissed off, goes into the next room, and browbeats Deslauriers, who’s tied to a chair, confused and helpless. That’s when I really turned on Mesrine. That’s when I wanted bad things to happen to him. They do. “Mesrine” is a biopic so it’s inevitably as cluttered as life, but director Richet and writer Abdel Raouf Dafri (who also wrote “Un Prophete”) are remarkably quick and clever with their transitions. My favorite may be early on, when two men discuss an “easy bank job” with Mesrine, who looks doubtful but says, “I’m in.” Cut to: that walk into Evreux prison. The post-kidnapping transition works well, too. When Jeanne and Mesrine go for the ransom, Deslauriers crawls through the apartment, breaks a window, gets help. The two gangsters return to see cops all over the place. Cut to: the Arizona desert, 1969, as six state patrol cars race after Mesrine and Jeanne in a convertible. Extradited back to Canada, the two are proclaimed a modern-day Bonnie and Clyde by the counter-culture press, and Mesrine revels in the role. But not for long. In prison, he’s beaten, stripped, firehoused. He suffers sleep deprivation and hunger. I had two thoughts: “Really? Canada?”; and “OK, let’s not make him sympathetic now.” I wanted to hold up a sign: Remember Deslauriers! Sympathy for Mesrine, or at least transference, is inevitable, though. We see this world through Mesrine’s eyes, he’s played by Cassell, who’s charming and handsome, and he’s doing what most of us sitting in the audience with our bucket of popcorn don’t begin to do: He acts out every impulse. Sure, he winds up in prison. But he also gets money and beautiful women and fame. “I go wherever I want,” he tells Jeanne when they meet. In prison, in fact, they don’t break him, he breaks out, using only his guile and a pair of wirecutters. Then, fulfilling a promise to a fellow inmate, he actually tries to break in. He returns in a Ford pickup truck and shoots it out with the guards. “Crazy Frenchman,” the inmate says, shaking his head with admiration. Mesrine is admired. His life is full. Hell, we’re watching a movie about him, aren’t we? How cool is that? “Mesrine” is a good film, or half of a good film, but so far it’s not a great film. For one, it’s hard to make biopics great. One also wonders: Why film this life of all lives? Because it’s exciting and absurd? Because audiences are always interested in gangsters, in men who do what they want, because most of us lead lives of quiet desperation? Because this is the way we can get a safe glimpse of what terrifies us—like at the zoo? Are we trying to understand him or be him? Perhaps we’ll find out in “Mesrine: L'ennemi public n°1,” which, unless Music Box Films is a sadistic distributor, should be available in the U.S. in September.